Notes: Spinoff of Tenchi Muyo. The reason for the name change to Magical Project S was for marketing purposes. Because of horrendous VHS sales of the OAV series, no one would touch anything named Magical Girl Pretty Sammy. Seems to have worked just fine. This review was written prior to Tim's, but his is labeled as the 1st opinion because it is the first complete review we have. 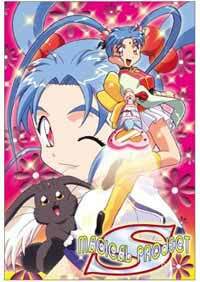 Perky junior-high schooler, Sasami Kawai, is chosen as the champion of good, Magical Girl Pretty Sammy, in a contest between Tsunami and her rival, Ramia. Along the way, many strange enemies appear and are defeated, and Pretty Sammy fights on, despite the fact that she has the single worst magical girl outfit in existence. Well, we asked for it. First, there was Sailor Moon. Then there was Wedding Peach. It was bound to happen. However, we didn't know the creators of Tenchi would take the Sasami as Usagi gag quite this far. In short, I want to see more! As much as I truly love the magical girl genre (having introduced Card Captor Sakura and Magical Stage Fancy Lala to the Assistant Reviewing Editor), it needed to be made fun of after the string of Sailor Moon clones and spinoffs (that's all I see Sailor Stars as) that came out. Painfully funny, yet necessary. Go rent Magical Project S, and you'll laugh, and laugh a LOT.